As it says on the welcome page of the National Alliance on Mental Illness St. Tammany websiteopens a new window, "There is no health without mental health." What is mental health? According to MentalHealth.govopens a new window, "Mental health includes our emotional, psychological, and social well-being. It affects how we think, feel, and act. It also helps determine how we handle stress, relate to others, and make choices. Mental health is important at every stage of life, from childhood and adolescence through adulthood." How prevalent is mental illness in the United States? Click hereopens a new window to see "Mental Health Facts in America" from the National Alliance on Mental Illness. 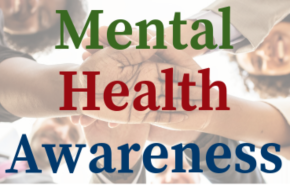 Throughout 2019, we will be discussing Mental Health Awareness in these blog posts. Our hope is to present resources that can help those of us who are experiencing a mental health concern. We also hope to help the friends, families, and colleagues of people who have a mental illness better understand what mental health is. Even though most of us personally know at least one person who has been diagnosed with a mental illness, the concept of mental illness can still be baffling to those who have never experienced it firsthand. It is our hope that by discussing mental health and sharing resources about mental illness, we can reduce the stigma associated with having a mental illness and promote mental health awareness. We're librarians, not mental healthcare professionals. We're advocates for those who need support fighting their mental illness. We're also people who have fought and are still fighting mental illness. We are striving to encourage those who want or need to seek help about a mental illness. If you need to talk to someone, there are people who want to help. “The National Suicide Prevention Lifelineopens a new window is a national network of local crisis centers that provides free and confidential emotional support to people in suicidal crisis or emotional distress 24 hours a day, 7 days a week.”​ Call 1-800-273-8255, text TALK to 741741, or chat onlineopens a new window. Check back later this month for the next blog post in this year's Mental Health Awareness series, in which we'll discuss Depression. Please note: the following list of resources is not meant to take the place of advice from a mental healthcare professional. "Get answers to your most common questions about mental health and mental illness--including anxiety, depression, bipolar and eating disorders, and more. [This book] walks readers through the most common questions about mental health and the process of getting help--from finding the best therapist to navigating harmful and toxic relationships and everything in between. In the same down-to-earth, friendly tone that makes her videos so popular, licensed marriage and family therapist and YouTube sensation Kati Morton clarifies and destigmatizes the struggles so many of us go through and encourages readers to reach out for help." "...provides a robust 800-entry survey of the field of psychology including notable people, theories, and terms, as well as landmark case studies and experiments." Available for use inside the library at the South Slidell Branch. ". . .addresses controversies related to mental illness including: What causes mental illness? How should mental illness be treated? Is involuntary treatment for the mentally ill ethical? What are the issues surrounding violence and the mentally ill?" "Former practicing psychiatrist Mark Rubinstein opens the door and takes the reader deep into the world of mental illness. From the chaos of a psychiatric emergency room to the bowels of a maximum security prison, the stories range from bizarre to poignant and the people from noble to callously uncaring. 'Bedlam’s Door' depicts the challenges mental illness poses for patients, their families, health-care professionals, and society. More importantly, it demystifies the subject while offering real hope for the future." "This is the standard reference for clinical practice in the mental health field. Since a complete description of the underlying pathological processes is not possible for most mental disorders, it is important to emphasize that the current diagnostic criteria are the best available description of how mental disorders are expressed and can be recognized by trained clinicians." Available for use inside the library at the Covington, Mandeville, and Slidell Branches. "Rosalynn Carter and coauthors Susan K. Golant and Kathryn E. Cade render an insightful, unsparing assessment of the state of mental health. Using stories from her 35 years of advocacy to springboard into a discussion of the larger issues at hand, Carter crafts an intimate and powerful account of a subject previously shrouded in stigma and shadow, surveying the dimensions of an issue that has affected us all. She describes a system that continues to fail those in need, even though recent scientific breakthroughs with mental illness have potential to help most people lead more normal lives." "This comprehensive five-volume set covers notable theories, people, social issues, life stages, the physiology and anatomy of the nervous system, and various mental illnesses or conditions --from publisher description." Available for use inside the library at the Slidell Branch.